GRACEFULLY GRAND – A TRADITIONAL KITCHEN DINING AREA WITH MODERN APPEAL! I struggle with my love of opposing aesthetics…modern vs. traditional. For example, I love this more traditional open kitchen and dining area just as much as I love the one I posted yesterday that was more modern. Well I guess my taste is like yin and yang…they go together to a certain extent…clean modern balances out the sometimes fanciful flourish of the traditional and conversely traditional softens the sometimes harder lines of the modern. Anyhooooo…enough of my treatise on modern and traditional decor and design. 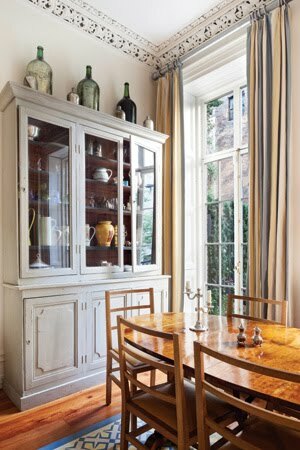 All of this to say, I LOVE this traditional space from New York City design maven Sheila Bridges. 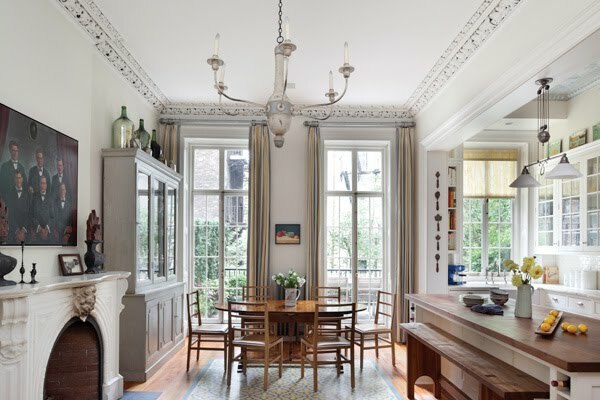 High ceilings, carved moldings, a soothing grey palette and regal but relatable furnishings. 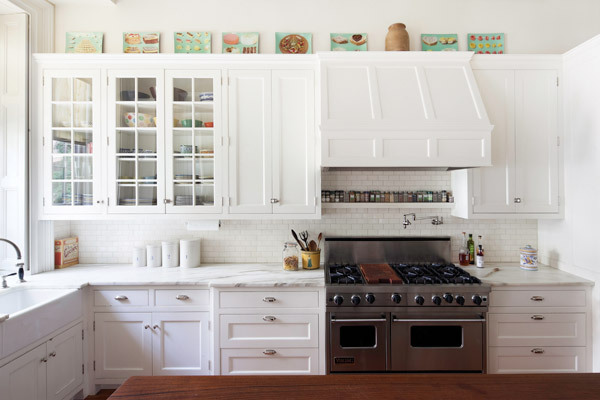 The kitchen is simple and white with a subway tile backsplash, marble counters, paneled cabinetry and a butcher block topped island. Enjoy yet another kitchen and dining area in my unplanned KITCHEN WEEK (will plan next time and actually call it officially KITCHEN WEEK)! P.S. And oh what a happy Thursday it has been. Will update y’all in the a.m.! I share your pain over the opposing styles and fear it leads to an unfocused jumble in my home, rather than the sanctuary of tranquility I desire. 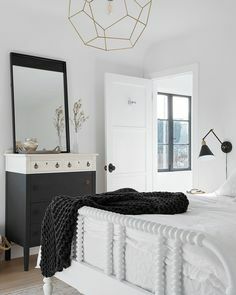 I love that crown molding. Totally beautiful and white! Love that! Absolutely stunning! My dream kitchen when my kids leave home! I OVE the opposing styles! The space is very elegant but still very comfortable. I think we all live with this struggle in design — what delights the eye vs. what works in our real lives. The trad vs. the mod, etc. This is a lovely blending. Love it, even though I really don’t know what kind of people lives a house like that? How can you afford it???? Might be one or two is your thing! I struggle with that too sometimes! !